The DRS-1R-500 Mono Class-A Microphone Preamplifier/DI from Phoenix Audio takes a modern approach to Class-A circuit design and delivers a wide range of tones without sacrificing the beloved vibe of true Class-A design. It can be used with all microphones including ribbons and dynamic mics to drive the output stage for a vast range of pure Class-A tones—from bold clarity to vintage warmth in broadcast TV or recording studio applications. 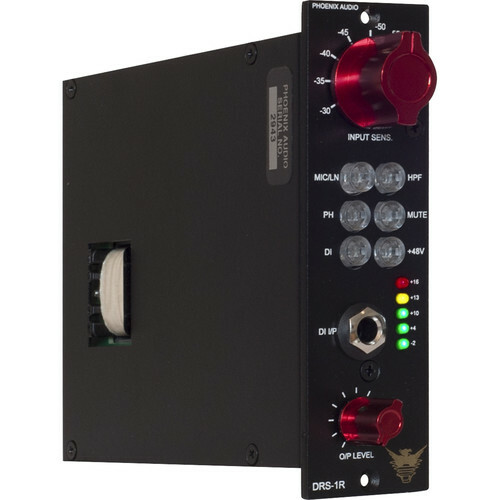 Featuring a -30 dB input pad, LED gain metering, and push buttons for hi-pass filter, phase reverse, and 48V phantom power, the DRS-1R-500 microphone preamplifier offers a frequency response of 20 Hz to 20 kHz. Other features include: 24V built PSU, custom wound DB694 output transformer, and PTFE silver-plated military-grade cable wiring. Like other engineers, you'll be reaching for the DRS-1R-500 repeatedly to deliver a vast array of sounds for any instrument or voice you're recording. The Phoenix DRS-1R-500 Mic Preamp/DI takes a modern approach to Class-A circuit design that delivers a wide range of tones without sacrificing the beloved vibe of true Class-A design. The mic/preamp's circuit can go from ultra-clean sounds suitable for audiophile recordings all the way to the warm, saturated tones reminiscent of the UK's most heralded vintage designs. The mic preamp's electronically-balanced, transformerless mic-input circuit delivers fast transients and the full-frequency spectrum (from sub-bass to the highest air band), while still delivering the full, warm and smooth characteristics that make engineers love Class-A mic preamps. Boldly outperforming transformer-based designs in both the frequency response and slew rate, the DRS-1R-500 delivers articulate, punchy, and full-bodied input signals, allowing you to drive the output stage for a vast range of pure Class-A tones, from bold clarity to vintage warmth to everything in-between. The DB694 output transformer is coupled to Phoenix's proprietary, fully discrete DSOP-2 output amplifier. The DSOP-2 is a direct descendent of the venerable TF1 amp, which Phoenix's head designer, David Rees, developed as an upgrade for vintage Neve modules. Going beyond the TF1, the DSOP-2 is the pinnacle of Class-A output circuit design, offering up a smooth transition from ultra-clean to beautifully saturated tones. The DRS-1R-500 mic pre series include very high input impedance DI circuits (10 MOhms) remarkably featuring no FETs on any of the channels. This design means that guitar and bass pickups are not loaded, allowing the natural sound of both modern and vintage instruments to shine and enhance the sound, and sparkle and growl as if they were plugged into your favorite amp. Synths, drum machines, and even laptops can likewise be sweetened by the DRS-1R-500's DI. Working with a clean, robust, electronically-balanced input signal, the DRS-1R-500 Mic Preamp/DI makes dialing in your exact sound easy, intuitive, and quick. By working the familiar stepped input gain control (up to 70 dB alone) and the -30 dB pad against the variable output fader (which provides an additional 10 dB of gain), you can dial in your preferred tones without having to consider an overly complex gain architecture. It's all about driving the versatile DSOP-2 output stage to your exacting tastes, whatever they may be in any given moment.